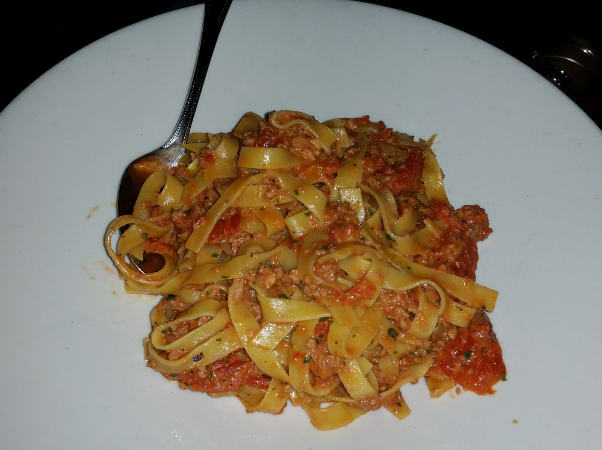 Trattoria Aroma on Bryant, once Just Pasta, is a casual, elegant eatery serving authentic Tuscan fare. 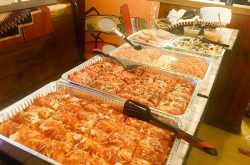 It was opened some years back by owners Breen Shea and David Consentino who have also opened Cafe Aroma on Elmwood, Trattoria Aroma Williamsville, and Trattoria Aroma North French. 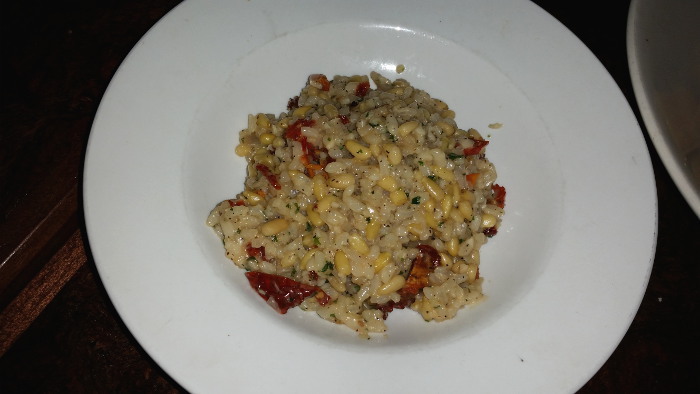 The three trattorias offer similarly fine dining, but you’ll find a few differences in the menus. Just a block off Elmwood, the atmosphere is urban casual, with a clubby feel you get with a high percentage of returning patrons. The “Elmwood chic” decor is comfortable and pleasantly roomy, highlighted by energetic red walls. 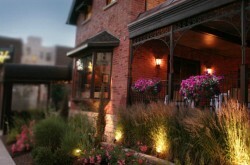 The front patio is a great spot for Sunday brunch or a relaxing weekday lunch in the summer. Service as a rule is efficient and well-educated. Like all popular restaurants they sometimes get slammed and struggle to keep pace. Parking in this area of Elmwood village can sometimes be a challenge. There is a parking lot two doors down on Bryant that is usually a good bet. I’ll just come right out and say it – Aroma is one of my favorite spots in the city. The food is consistently good or great. The menu is broad but well managed, with enough creativity to make it a fun read. The crowd is generally interesting and vibrant. To me it has a unique West Village sort of feel, but with all the comforts of Buffalo. Our server was knowledgeable about the menu, didn’t hesitate to suggest items and was helpful in choosing the proper wine. 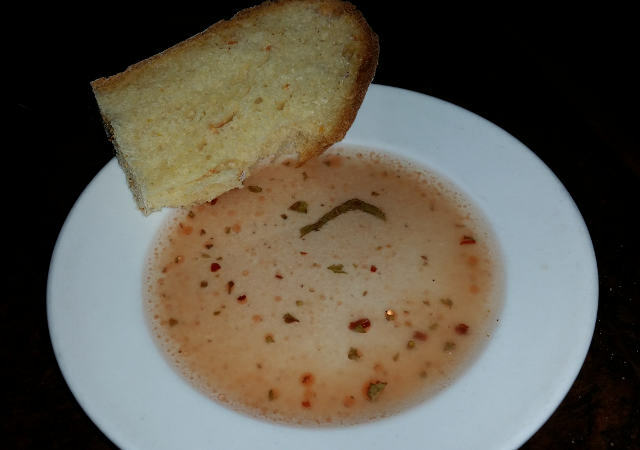 Bread and seasoned olive oil were brought to the table as we looked over the menu. The bread is an excellent crusty bread made/baked in house according to our waiter. The oil is an appealing mix of seasonings (maybe some citrus?). 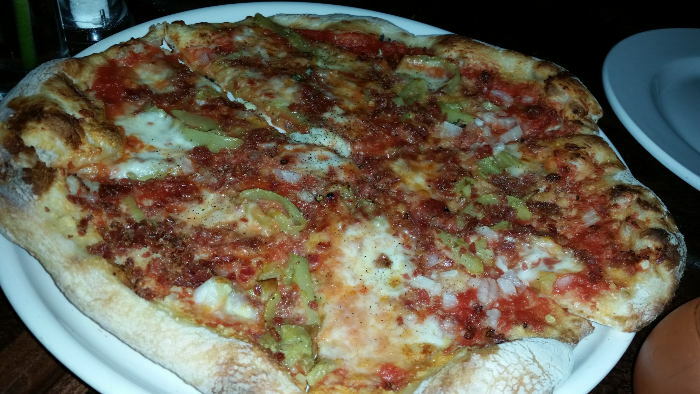 For an appetizer we went with a Pizza Rossa, the Calabrese covered with sopressata, banana pepper, white onion, fresh mozzarella – $15. 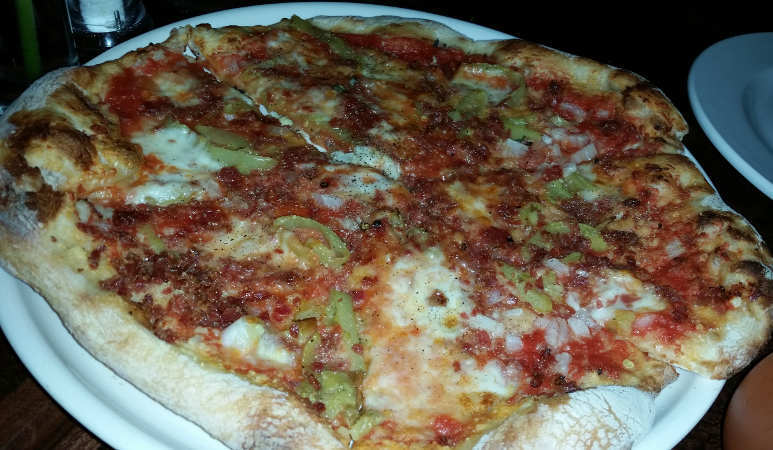 Fresh, house made dough with quality ingredients…you can’t go wrong. A nice not-too-thin crusty crust. Based on four entree orders you might get the sense that it was a cold evening and we were all hungry. House made pasta and done right. You can tell when time goes into a really good sauce to develop a deep flavor with quality ingredients. 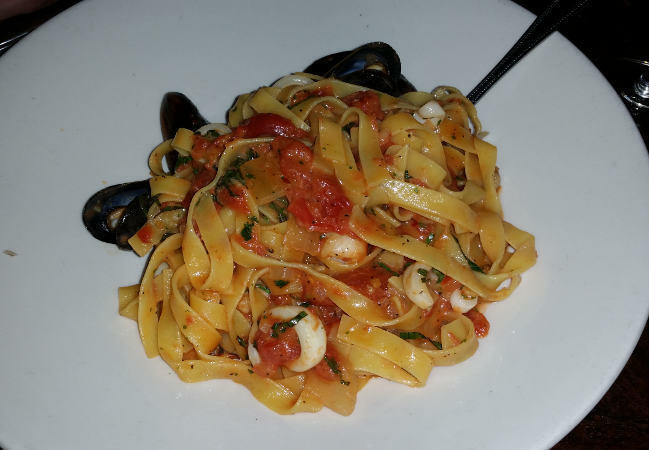 Tagliatelle Frutti Di Mare – p. e. i. muscles, tiger shrimp, calamari, basil, red sauce, chili oil – $27. This is a beautiful seafood pasta dish with thick luscious tag noodles. The red sauce is more tomato than sauce with an underlying taste of the sea. One of those dishes whose sum is greater than its parts. 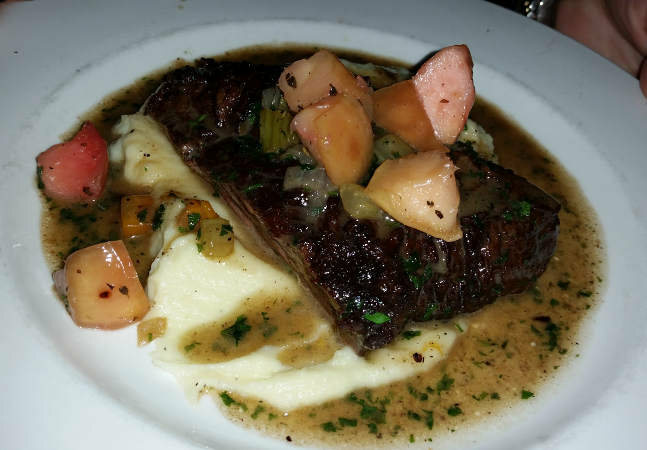 Cider Braised Beef Short Ribs – potato purée, roasted apple relish, and pan jus- $26.00. The perfect cold night entree, which unfortunately is still in play. The apple relish is a nice touch. 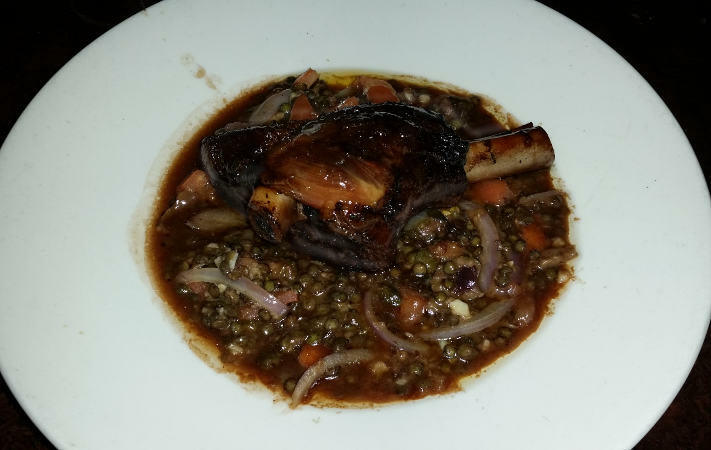 Agnello – braised 12 ounce lamb shank, Sicilian olive caper tomato green lentils with red chili oil – $28. A meaty lamb shank swimming in a green lentil stew like side. I love the flavor of a well cooked lamb shank. This has Tuscan feast written all over it. 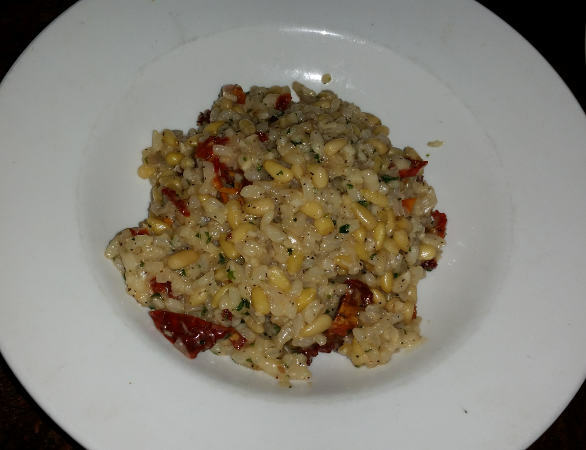 We also ordered a Risotto on the side. Creamy and delicious, this might be the best $5 you’ll ever spend. 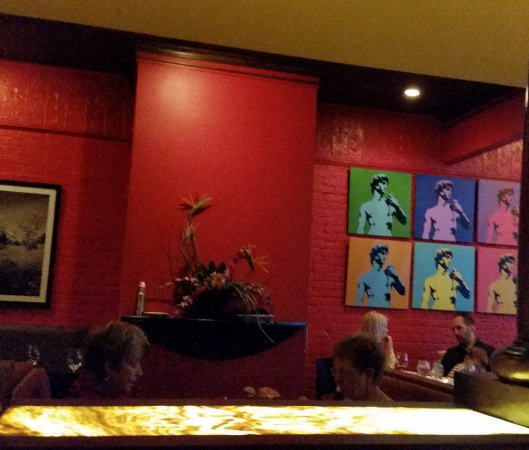 Trattoria Aroma has a first class wine list and maybe the best selection of Italian wines in WNY. We went with a “FARNITO”, CARPINETO IGT 2008 (Cabarnet Sauvignon). The description on the menu – “full bodied, ripe red cherries, licorice and spice” should have included “outstanding” as well – $57.